Technology Timeout: Pic Collage - So many uses! Happy Fourth of July everyone! I'm recuperating this morning from a late night Orioles game (Go O's!). The game started about an hour late, so by the time the 3 hour 15 minute game was over (and we watched the post-game fireworks), we didn't get home until after midnight. What's terrific was that we were able to get home from Baltimore in about 18 minutes! That's one of the good things about living so close to the city - having the opportunity to experience many awesome things (ball games, museums, etc.) and get home relatively quickly:) But thankfully, the kids slept until about 9:45 (and I did too!). Anywho, back to the topic - Pic Collage! It is a free app at the app store, and is a great go-to for a quick assessment (or quick introduction to a topic for that matter). 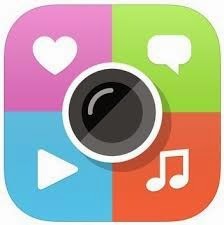 For those of you who are unfamiliar with it, PicCollage is a free app that allows users to import pictures from your camera roll, the web, or even take pictures within the app. Once you have imported your pictures, you can size them how you like, add video, add text, or even add stickers. This is an overview of all of the different buttons on the main screen. There are several different layout options (including a scattered layout where you move all of the pictures wherever you want to). There are some pretty terrific fonts included! Choose different patterns for your background. There are some cute stickers included, but not many of them. There is an in-app sticker purchase if you wish. 1. Have students create a board for a vocabulary word. They could find pictures that illustrate the word, as well as add text defining the word, and including an example. 2. Have students compare and contrast a particular topic (such as reflection and refraction in science). They can find pictures of each, and type definitions or examples. 3. Create a board to share with your class about a new topic. Include only picture clues and see if they can figure out what your new unit will be about. Hopefully, you have some ideas you can take back to your classroom and use this awesome app to inspire some creativity with your students! Can you believe I don't have Pic Collage? I use Instacollage and Instaframe, but I don't have this one. Adding it right now! Thanks for the pictures and p.s....GO RED SOX! Lol! I'm glad you found a new app:) I hope you enjoy using it!